The oil price rose to a 27-month high this morning as the ongoing disruption following last weekend's oil leak in Alaska drove fears of supply shortages. The cost of a barrel of Brent crude – oil sourced from the North Sea – hit $98 this morning, its highest level since October 2008 before the global economic downturn took hold. US crude oil also rose to $91.65 a barrel, close to its own 27-month high. Energy prices have been under pressure since the closure last Saturday of the 800-mile pipeline that transports oil from Northen Alaska, following a leak in a pumping station. 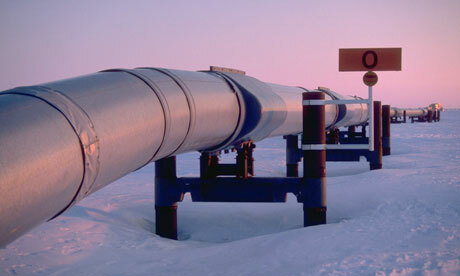 This has forced a 95% cut in production at Prudhoe Bay, the source of around 15% of US oil output. SHOOT: This should give you an idea of just how sensitive the energy supply markets are. A leak in one pipeline now drives world energy prices up by entire percentiles, no longer small fractions of a percentage as was the case in the past. The luxury has now passed us by, we're living in much leaner energy times now, and there should be stricter controls in discretionary energy usage. Ever since the 50's, the oil companies have ruined the SE Louisiana marshes by cutting pipeline canals allowing salt water intrusion.a village accessible only by boat, that feels they are on the brink of extinction. The indigenous Atakapa-Ishak people in this coastal Louisiana village have relied on the land and water around.thanks for sharing this!